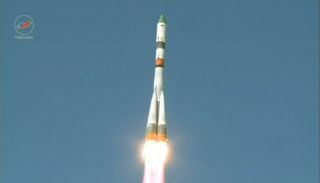 Russia's robotic Progress 59 cargo spacecraft launches toward the International Space Station atop a Soyuz rocket from Baikonur Cosmodrome in Kazakhstan on April 28, 2015. A Russian cargo vessel suffered a serious malfunction on its way to the space station, NASA's MESSENGER probe slammed into Mercury and the New Horizons spacecraft snapped the best-ever photos of Pluto. Here's a look at Space.com's top stories of the week.